So Tyrod is officially gone and the Bills only quarterback is Nathan Peterman. Anyone want him to start next year? Didn’t think so. The wisdom says the Bills are going to trade up for the quarterback of their dreams. That’s fine as long as you can get that guy. I don’t like fans that say trade up and get the guy they want. By now everyone should have an opinion on the guy they want. Put a name to a guy. I want Josh Rosen. I would like the Bills to move up and get Josh Rosen. That’s plan A for me. But I realize that plan A doesn’t always work. Brandon Beane’s job is run through all of the different scenarios and have a plan B, C and D.
What if in my scenario Josh Rosen isn’t available. What do I do? What if QB’s go 1,2, and 3 in the draft? I’m not saying that the Browns, Giants and Colts will take a QB but if they don’t want to take a QB then they will trade out. The Broncos and Jets are a lot closer to 2 and 3 than the Bills. It’s time to think outside the box. Here’s one scenario that I think the Bills should at least consider. 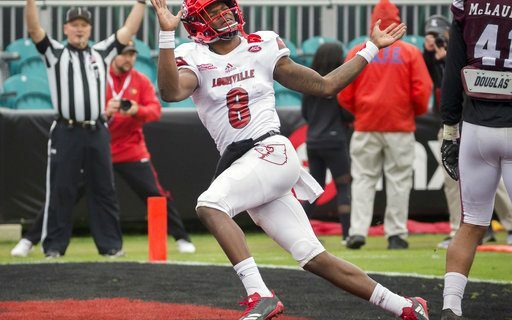 Pick 21 take Lamar Jackson-Louisville- Jackson has great potential. He can throw the ball 90 yards. He has the elusiveness that Tyrod had in the pocket. The best news to come out of the combine about Jackson is some scouts think that his accuracy problem could be fixed. Many times Jackson doesn’t have a wide enough base on his throws. This is an easier fix than an arm delivery that a QB has been doing for his whole life. The upside on Jackson is immense. This is about when many experts think he might go. Pick 22- pick QB Kyle Lauletta Richmond- Lauletta is flying up the boards. A three- year starter at Richmond that completed 65 percent of his passes for over 10,000 yards. His off-season has been a grand slam home run. He was MVP of the Senior Bowl and at the combine word is he blew away every team in his interviews. He has a quick release and maybe the best QB in the draft at throwing people open. He has been compared to Jimmy Garroppolo. Fear for me is all of the rumors are true and New England takes him at 31. So if the QB that you want the Bills to trade up for is off of the board, isn’t this a scenario that needs to be talked about. How do the Bills get a franchise QB? Do they trade all of their resources for a guy that they may not love or do they take a swing at two guys. Is that crazy? I don’t think so. The Washington Redskins were the last team to take two QB’s in the same draft. RG III and Kirk Cousins. Looking back it’s a good thing that the Redskins did take Kirk Cousins. Everyone after that draft made fun of the Redskins. It turned out to be a good move for Washington because Cousins had a much better career with them than RG III. If both Jackson and Lauletta look good you know the Bills could trade one of them for a nice draft pick. People all the time say you should take a QB every year until you find a good one. If that’s not crazy why is this scenario so crazy? You have the draft capital, why not take two this year in a good QB class and have double the chance to find your franchise guy. If the Bills can’t get my guy Josh Rosen I think this is a very plausible scenario that they should consider.